The Steel Detailer Member Insertion is the only Steelwork Library Insertion Software of its kind. 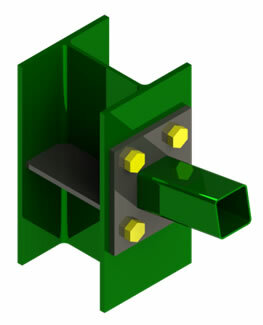 Imagine inserting a bolted connection in a Sub Assembly Weldment Member based on selecting the member you are inserting the connection into and the member you are connecting to. After configuring the connection to suit the design, why not copy it to another member. You can buy Connections from this website in order to populate your library. You can upload multiple Connections or single Connections to the library for insertion into your projects from here. Alternatively you can create your own. The Steel Detailer gives you the functionality to look through the Connection Library and add a new Connection and or delete a Connection. 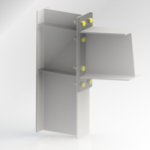 The Steel Detailer Allows you to copy an Existing Connection from the Project and Attach it to another Welded Member Sub Assembly. The Connection Model is Renamed in a sequential order and inserted, mated into position along with the associated Plate drawings. Select from the Available configurations to match the position being inserted upon. When using The Steel Detailer you can be sure you’ll find all of your library Connections fast for insertion. No searching through folders in explorer and looking for that model you used on a specific project. 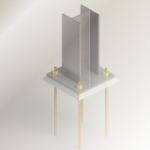 Select from the a connection type filter and drill down on a model for insertion. Yes … it’s that simple! All of the models under the search criteria is selectable and insertable. 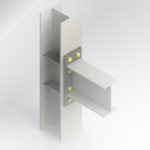 Insert a connection into a weldment sub assembly and modify it by selecting configurations, plate thickness, hole centres and sizes. When creating connections it is really important to fin the right plate when you need it right at your finger tips. The user can upload multiple plates at once from the plate library found here. Or they can create their own plates and upload them one at a time. The difference compared to using templates is that the plate comes with its associated detailed drawing. No need to recreate drawings for plates over and over again or change references. This tool is a pick and shoot for plates in connections. 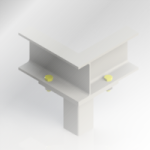 Bolts are included, but are not smart fasteners or standard SolidWorks Part models. Inserting Plates into a Connection is a Breeze. Need to insert a specific plate into a connection. Just pick and shoot, it’s that easy. 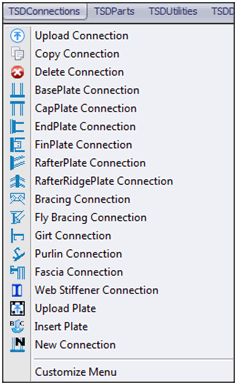 By selecting a connection type, sketch point and the sections used in the connection, a new connection complete with matching dummy sections is created and placed in the first selected members assembly for plate placement.